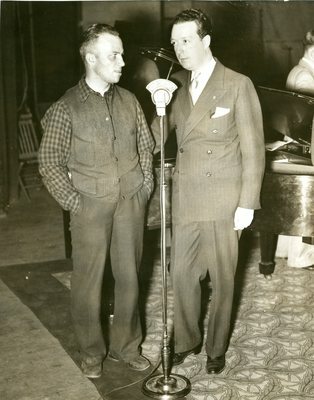 "Charley Miller's First Radio Appearance with Linus Travers "
A black and white photograph of Maine guide Charley Miller labeled with a caption on the back, "First Radio Appearance with Linus Travers, Boston, 1936." The call letters on the microphone read WNAC. The name "Ben Fitz Gerald" has also been written in handwriting on the back of the photo.